The Honda four-stroke EG3600CX generator has a maximum AC output of 3600VA and is equipped with a large fuel tank holding 24 litres allowing it to run continuously for 11.9hrs. 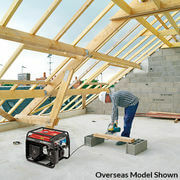 The anti-vibrating engine mounts ensure this generator is quiet and the mufflers are noise suppressing keeping operational noise to a minimum. It deliver stable power thanks to Honda's highly advanced Digital Auto Voltage Regulator ( D-AVR) which utilises a microcomputer to accurately control output voltage, delivering high quality stable electricity. 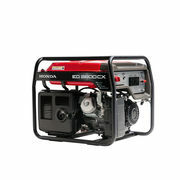 User safety is a top priority at Honda which is why this generator is fitted with a AC/ DC circuit breaker and an oil alert light comes standard. 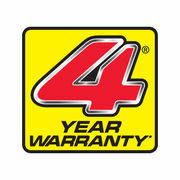 As usual this Honda product comes with a 4 year domestic warranty and a 1 year commercial warranty showing you that this product is backed in for the long haul. Buy reliability, predictability and quality. Buy a Honda.